An absurd architectonic beauty captures the first sight. 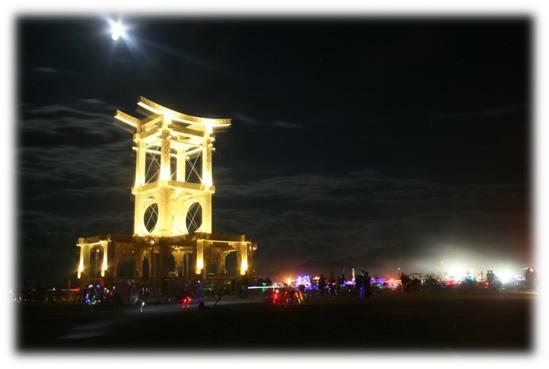 Constructed entirely of light colored wood, and finished up with a refined edge carving, the peace temple is simply wonderful – eespecially when viewed at nights and sunrises. The internal walls are loaded with writings from top to bottom, any place that can be reached. They’re all notes for lost family members, old loves, new lovers, lost friends and gained ones, unnecessary wars, any affliction or thankful thought. Everyone makes a personal mark in the peace temple, some even leave small personally important objects. By Saturday there’s not even an open inch on the lower walls. It’s sad to think that all this beauty is going to turn into nothing more than a handful of ashes after Saturday night, when all burners gather around it and await for its elegant construction to smack the ground. They all watch the fire in silence, the flames grow bigger and bigger while everyone meditates over this experience that is now reaching its completion, and reflect about the world they have to return to.